I have a pretty wicked sweet tooth. I suspect I have about 20 of them. Not for long perhaps. Sweet teeth are like the suicide bombers of the dental realm – their core desire is incompatible with their continued existence. If they get what they want, they won’t be around for very long. After eating anything savoury, particularly anything salty, my 20 foot soldiers of desire teeth kick into action and create a craving for sugar so strong that I’m often half way into some kind of chocolate monstrosity before I know what’s happened. If I do realise, I very rarely spit it out. I normally say “oh, well. It would be a shame to toss this out,” and so I jam the entire thing into my cake hole, muttering something about hungry kids in Africa and then my body downloads a few gigabytes of regret. Resisting desire like this is tough. It’s self generating, and so fighting it tends to give it more power. When you suppress it, you’re not getting rid of it, you’re just packing it into a smaller space – making it more dense. More focussed. You’re spring loading your desire, and given any opportunity, it will break out with an explosive power directly proportional to the degree to which you tried to keep it down. It seems really powerful, when you think about it like this. And it is. You suppress the feelings, at the cost of being eternally vigilant. You have to play a perfect game to keep them down, but they only have to leverage one opportunity, one moment of weakness and they’ve won. But this power is really brittle. In only works in one direction. It only grows when you resist or run away from it. This kind of power doesn’t stand up well to scrutiny and is absolutely devastated by a loving curiosity. Willingly get closer to it, examine it with curiosity, and before your eyes, it’s power will diminish. In the buddhist mythology, this is known as “inviting Mara to tea”. It comes from the story of the Buddha’s enlightenment, during which the Demon god Mara assaulted the Buddha with doubt, fear, lust and anger. 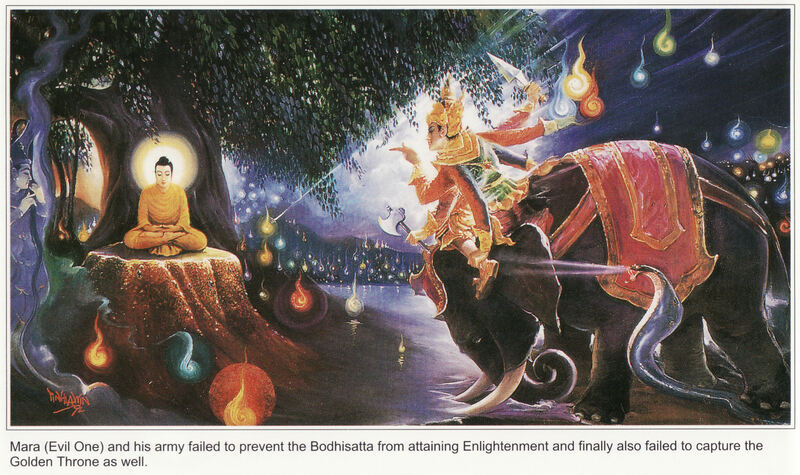 Mara failed to corrupt the Buddha and left on the morning of his enlightenment, but would periodically return. “Even after the Buddha had become deeply revered throughout India, Mara continued to make unexpected appearances. The Buddha’s loyal attendant, Ananda, always on the lookout for any harm that might come to his teacher, would report with dismay that the “Evil One” had again returned. The story is a great illustration of the power of leaning into difficult feelings with a view to depriving them of they illusory power. you can invite Mara to tea, and sit down with the experience and examine it. This last option is interesting because it tends to have the same effect as what you want from options 1 and 2, but without the negative consequences. The price that you pay in this case, is attention, effort and time. It requires your attention to realise what’s going on. It is a brief effort to stop and sit and turn the craving over in your mind. It will take a moment to watch all the power fall away. It’s worth noting that this doesn’t banish the craving forever. Like Mara, it will probably come back, but each time it does, it has to start from scratch. It doesn’t have any residual power from your last encounter. It’s also worth noting, that this kind of metaphor or mythological framework is just as illusory as the power of desire. Mara doesn’t exist, and neither does the tea. But they are both helpful tools for dealing with powerful behavioural and chemical processes which happen in our body at a speed and scale which are difficult for us to fathom. Sometimes it’s helpful to move the fight to a battleground where we have more options, where we’re more familiar. Since we’re creatures driven by story and narrative, mythological stories resonate with us pretty deeply. Hence Jesus et al. So, back to the chocolate. If you don’t want to contribute to the world’s alarming Diabetes statistics and but you’re staring down the barrel of 20 sweet teeth screaming at you for sugar, then all you need to do is step a little closer. Invite those teeth to tea, sit down for a second and look at what they want. Approach their demands with curiosity, turning them over in your mind and then watch them dissolve. It’s surprisingly easy, the difficulty comes in remembering to do it. Mara moves quickly, riding in on a storm of fresh horses with the wind at her back. You have to be prepared to get out in front of her and just sit. But I figure, if you’ve got time to smoke or eat chocolate, you’ve got time to have a cup of tea with an imaginary, demonic, manifestation of human desire for the purposes of combatting the impulses of invisible chemical forces at war in your brain. Right? If you like this, please share it. It’s hugely appreciated.